Also published on the Ziauddin University Atlas Blog. MANY years ago my grandfather gave my father a watch and my father gave it to me. 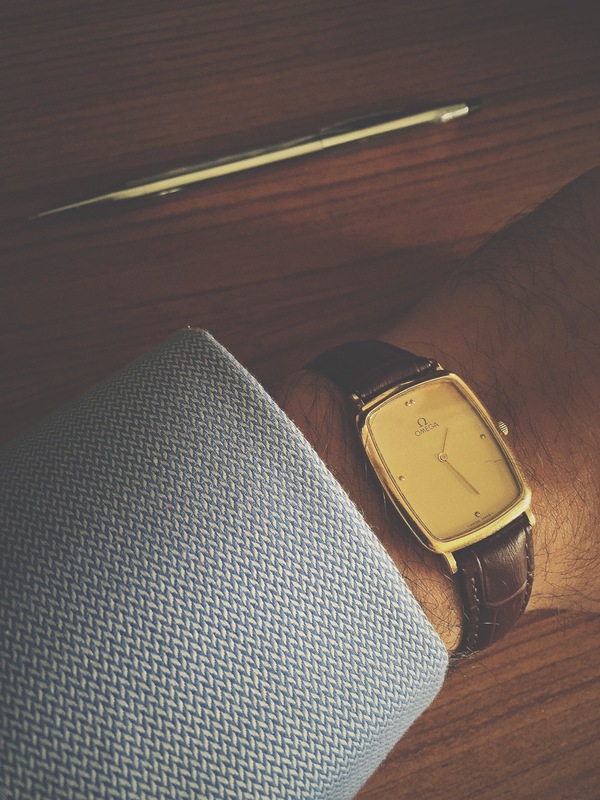 It’s an old Omega De Ville — soft, brushed gold that catches the light just so on those long summer Sundays in Karachi. Watches are strange beasts: precious metals forged in the fiery cores of supernovae, held in place by delicate strips of perishable leather; keeping time to the warmth of other suns. If built true and kept well, the metal soul of a watch will outlast the wearer and be passed on with a bit of history and a patina of character. But the leather will not last. Sweat and rain and time will break it down, eventually. The aged, aged man is Kronos, God of Time. Chronology and chronographs are Chinese whispers of his name. But his kingdom can not lay claim to all of time. Quantitative time is his province, the one that my old Omega ticks off the seconds to. And while it’s a vast, powerful state, its smaller neighbour is just as essential to temporality. One of the disadvantages of living in this city by the sea is the havoc wrought by humidity. Leather straps rarely last more than a few years. The last one was a rich, dark brown with a word embossed on the reverse in small, block letters: K A I R O S. Kairos, the God of qualitative time. So while Kronos charts out the maps which underlie our lives — from the alarm-clock that wakes us from the wistful nostalgia of our dreams, to the calendars that lay out our days of work and leisure, leisure and work — Kairos marks out our lives themselves — the sunset conversations with old friends that end far too soon; the endless years spent in a half-hour noon nap’s dreamworlds. Kronos with his time and Kairos with his timing. And in between these two oceans stand the lighthouses of our lives, lights aimed first at one, then the other, forever afraid of committing fully to either. And perhaps that’s best. For without the strap or without the metal, the watch is incomplete. But put them together and you have a marvel of ingenuity and engineering that proclaims the passage of Time — and also the subtler passing of the times. And as one generation passes on its wisdom to the next, we are, before we know it, adrift between the gods.